Deutsche Grammophon proudly presents the most authoritative Schubert project ever made, featuring all the masterpieces in timeless recordings � plus many rare gems that manifest Schubert�s genius. 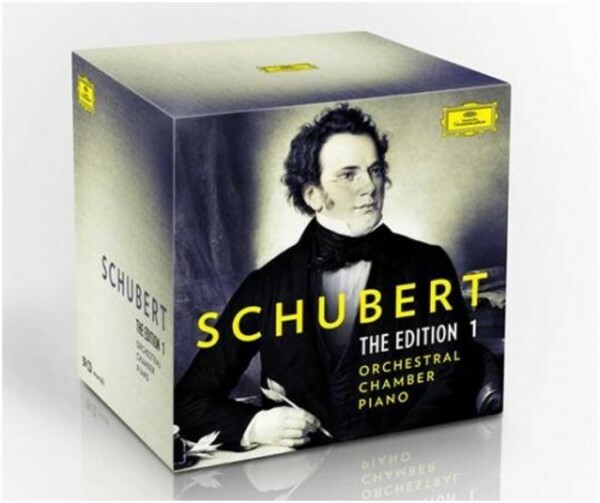 This first edition comprehensively covers Schubert�s vast orchestral, chamber and piano output, containing all the masterworks in definitive recordings by legendary artists: Abbado (symphonies), Kempff (piano sonatas), Melos Quartet (string quartets & string quintet � the latter with Rostropovich), Pires (piano works), Gidon Kremer (violin works), Beaux Arts Trio (trios). Individual recordings of famous works include the 'Trout' Quintet with the Amadeus Quartet and Emil Gilels, and string trios with the Grumiaux Trio. The rarities collected here include well-received completions of Symphonies Nos 7, 8 & 10 by British musicologist Brian Newbould, played by the Academy of St Martins in the Field under Neville Marriner, a set of early overtures played by the Haydn Sinfonietta Wien, as well as many little-known piano solo and duet pieces (with J�rg Demus and Paul Badura-Skoda) � one of the many delights of the set. A bonus disc compares three legendary recordings of the 'Unfinished' Symphony, conducted by Carlos Kleiber, Wilhelm Furtw�ngler and Leopold Stokowski. Two of the recordings featured have never been released before (Marches militaires D733 Nos 2 & 3 by Paul Badura-Skoda & J�rg Demus). - Waltzes, German Dances, �cossaises, Minuets, L�ndler, Fantasy etc.